Choosing mulch for vegetable garden beds can be intimidating. The good news is that there are lots of great vegetable garden mulches to choose from! 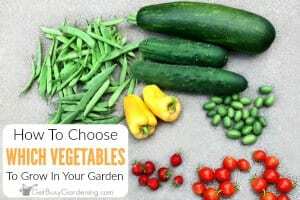 In this post, you’ll learn all about the different types, including the benefits and cautions of each, which ones to avoid, and how to choose the best mulch for vegetables. 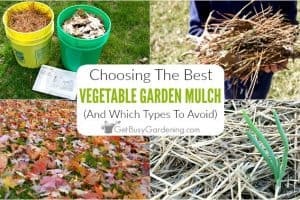 If you’ve ever been down the mulch isle at your local garden center, you know that there’s an overwhelming amount of options to choose from. But did you know that many types of common landscaping mulches are not good to use in your vegetable plot? 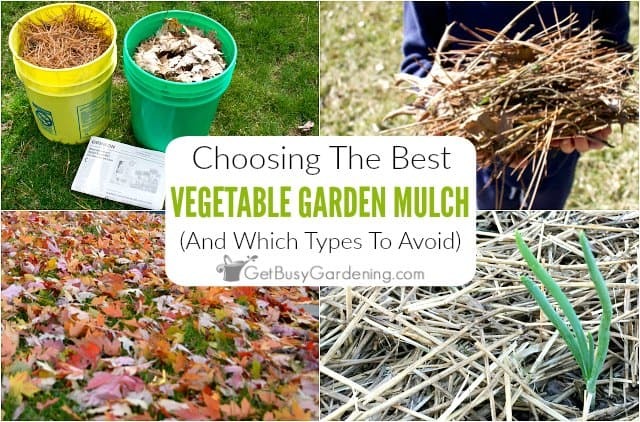 When it comes to mulching a vegetable garden, it’s very important to choose the right type of mulch. Don’t worry, there are tons of wonderful vegetable garden mulches to choose from. You just need to understand what to look for, and learn the pros and cons to each one before you decide what’s best. So let’s review our options. 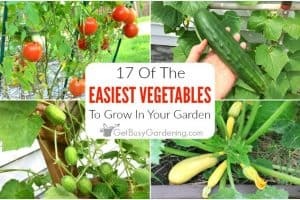 Then you can choose the very best vegetable garden mulch for you. When it comes to choosing the best mulch for vegetable garden beds, it’s important to understand that one type does not fit all! There are lots of different mulching materials for gardens, but certain ones won’t work well in vegetable beds. So first, let’s talk about which ones to avoid using in your vegetable patch. Stay away from using any type of heavy materials in your veggie garden. Hardwood mulch, rocks, or inorganic materials like rubber and plastic are much too heavy, and will make planting difficult. 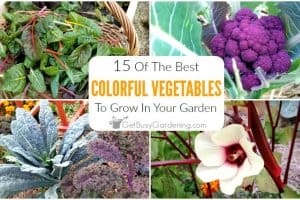 So stick to using these heavier mulching materials in your flower beds or garden paths, and keep them out of your veggie garden. 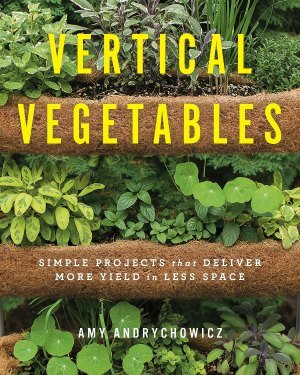 Vegetable plants thrive when you use light, organic materials that break down quickly. You can till them into the soil every year, or just keep piling more on top. The best part about using natural mulches is that you may not even need to buy anything. Many of these materials can be found right in your own backyard. Grass clippings are a great organic option for vegetable garden mulch. You can use the clippings from your own lawn, or ask your neighbor for theirs. 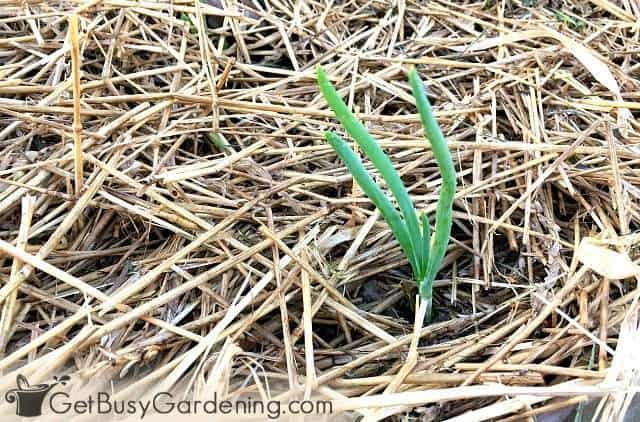 Grass mulch is a great way to keep those weeds at bay during the growing season. Plus it’s free, and you can’t beat that price tag! But there are a few precautions to think about. First, never use grass clippings from a lawn that is treated with chemicals. Lawn chemicals contain herbicides that can cause major problems in your garden, and may even kill your plants. Also, be sure to use grass clippings from the lawn before it goes to seed. You don’t want to dump grass seeds into your veggie patch. Hay and straw are popular choices. Both are great for vegetable garden mulches, and they give it a nice finished look. They are easy to find at any home improvement store or garden center. Plus the bales are inexpensive to buy (especially in the fall!). However, if your garden does not drain well, these mulches can become moldy. Also, some types of hay or straw can be filled with seeds. So be sure to purchase high-quality, seed-free bales. Otherwise, if you live in a cold climate like I do, purchase the bales in the fall and leave them outside. The cold weather during the winter will kill many of the seeds for you. 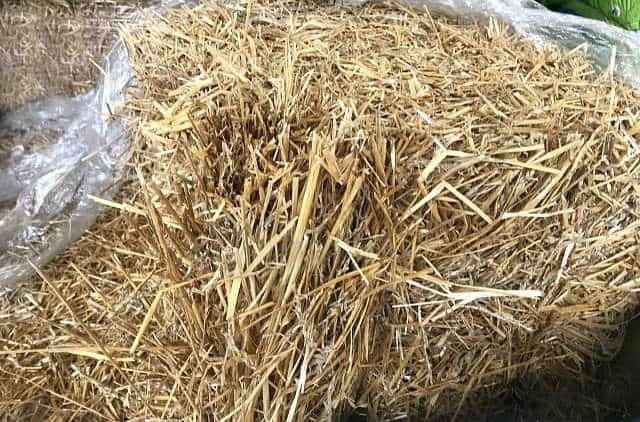 Sawdust is a great mulching material, and can be free if you know someone who does a lot of woodworking. It keeps weeds from growing, and looks nice too. However, sawdust can be acidic, so be sure test the pH level of your soil if you use a lot of sawdust mulch. Adding garden lime to the soil will neutralize the acidity. Also, if your plants start looking a little sad or turn yellow, it may be because the sawdust is leaching nitrogen from your soil. If this happens, add extra nitrogen into the soil, or mix it into the sawdust before mulching. 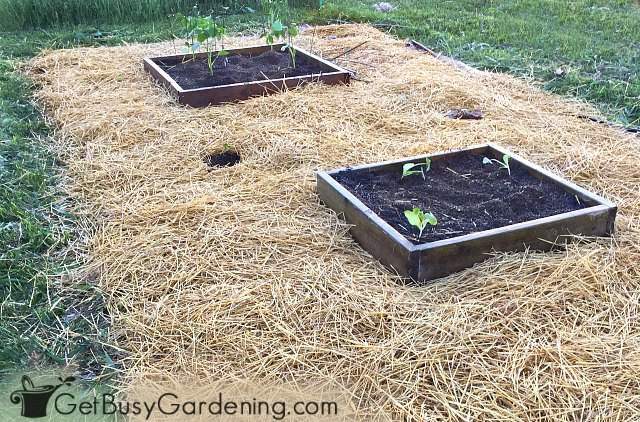 Pine needles are another great vegetable garden mulch option. For those of you that live surrounded by pine trees, this is another free one. It’s true that pine needles are acidic, and can add extra acidity to your soil. So it’s a good idea to monitor the pH level of the soil if pine needles are your mulch of choice. If you’re worried, then be careful using it around your non-acid loving plants (like most vegetables). Adding garden lime to your vegetable patch is an easy fix to neutralize acidic soil. 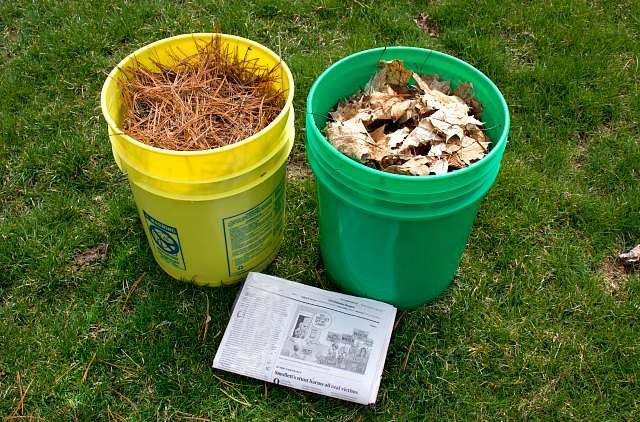 Instead of sending your Sunday paper to the recycling bin every week, keep it to use for mulch! Newspapers add protection to your garden, and keep weeds from growing. Modern newspapers are printed using soy-based ink, which is non-toxic and biodegradable. If you’re concerned, then it’s best to check with your newspaper provider to be certain they use non-toxic ink. Also, since it’s very lightweight, the paper will blow away in the wind. So it’s a good idea to either shred it and wet it down, or cover it with another type of mulch to keep it from blowing away. 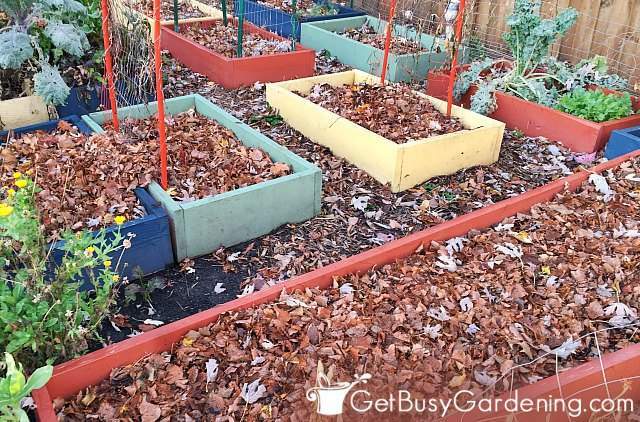 Leaves are everywhere, and the top vegetable garden mulch choice for many. They’re easy to use, since you can just toss them over your beds as you rake them up in the fall. Plus they’re free! But not all leaves are created equal. So be sure you know what type of tree your leaves come from before using them to much your veggie garden. Some types of leaves (like those from a black walnut tree) contain substances that will hinder plant growth, or even kill susceptible vegetables. Dried leaves can also become compacted, which can create a hard surface over your garden. This can prevent water from soaking into the soil. So, just be sure to keep them wet so they decompose faster. Compost is made of organic materials you discarded from your kitchen or yard. It’s nutrient-rich, and helps the environment by keeping food waste out of the trash. If you don’t have a compost bin, it’s easy to find it for sale at your local garden center. There are a couple of things to consider before using compost as vegetable garden mulch. First, it will need to be refreshed regularly to keep weeds from becoming established. Also, homemade compost can contain seeds. So be sure everything is well composted before using it in your veggie beds. Cardboard is another wonderful option for mulching vegetable beds, and is readily available. It does a fantastic job of keeping the weeds from growing, and can also be used to smother existing weeds. Since it’s so lightweight, you may need to secure it to keep it from blowing away. Or you can cover it with another type of mulch to weigh it down. To make planting easier, it’s best to lay it cardboard down after everything is planted. Also, since cardboard is so dense it will break down much slower if it dries out. What Is The Best Mulch For Vegetable Gardens? So, what is the best mulch for vegetable beds? The good news is that there really is no right or wrong answer here. 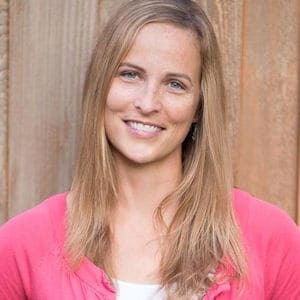 Many times choosing a mulch for vegetable gardens comes down to personal preference. You don’t need to choose only one type either. You can mix and match any of these organic mulches. 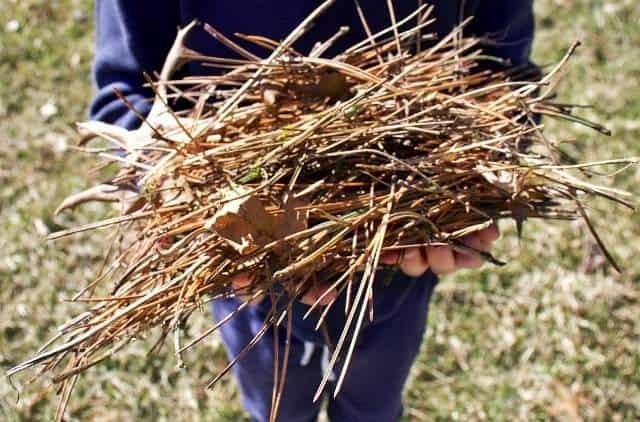 For example, you can mix pine needles and grass clippings. Or cover newspaper and cardboard with leaves and straw. If you’re still not sure which option to try, then start with whatever is available to you. As you gain more experience, you will figure out which type you prefer. Deciding what kind of mulch is best for a vegetable garden doesn’t have to be intimidating. Experiment with whatever you have available to you to see which one you like the best. Just remember to always choose a lightweight, organic mulch for vegetable garden beds. 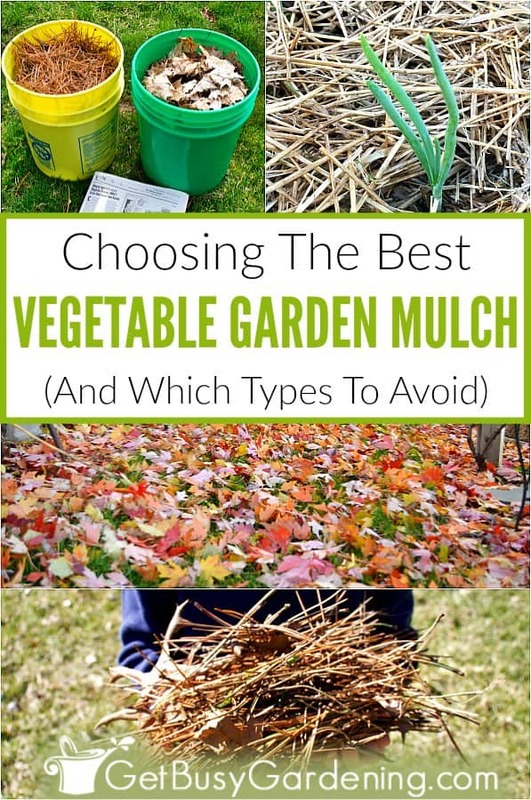 What is your favorite mulch for vegetable a garden? Tell us in the comments below!